Secret Gardens Best Wedding/Honeymoon or Anytime Escape Villa! We are not just a vacation rental, we offer great vacation experiences. A sand pebble on the map, yet an entire world unto its own…Secret Gardens is the royal gem of the exclusive Picara Point peninsula! This sultry dual level sanctuary embellishes the best that premier accommodations offer. Nestled behind an electronic gate, the villas plush intimacy is unmatched yet offers the grand scale of larger sized villas and has hosted the royal, celebrity and social elite. Once you experience this timeless masterpiece, life as you know it dramatically changes! The stone-laid courtyard bestows a tropical salute as you enter the Great Room (Terrace Level). Imported timbers from Tobago frame the cathedral inspired ceiling only to be surpassed by the hand-painted mural depicting the villas spectacular surroundings. This architectural wonder welcomes you with appointments fit for any King, yet especially prepared for the Queen. Fully air conditioned, this villa commands your attention with sumptuous furnishings inspired from Bali, Africa, and the Mediterranean. The palatial design is further enhanced by surround sound throughout as you listen from plump leather couches to the dance of the music. An impressive collection of exotic wood finishes present an expansive wall of glass paned eight foot doors. A large covered verandah is conveniently located for morning massages, outdoor lounging or magical candlelit dining experiences. A luxurious gourmet kitchen laden with jade and onyx colored granite countertops, double ovens, a gas range with grill & griddle, bun warmer, subzero refrigerator, microwave and cookware accommodates your culinary indulgence. The beautiful master king suite seductively anticipates your every desire, with a romantic four-poster bed and furnishings, beautiful terra cotta tiles, large double shower, and a customized relax and renew Jacuzzi tub generously sized for two. Natural titan boulders soar towards azure skies while guiding you down to the Garden Level (Second Floor). A second master suite, chosen by many as their first, takes your breath away with ultra soft canopied bedding. The charming suite features a kitchenette, an intimate sitting area, as well as separate his & her master baths with a soaking tub and natural rock shower. The pyramid shaped infinity-edged pool with Sun Deck is nestled a mere 25ft above the waters edge and surrounds you within its total serenity. Secret Gardens’ protective borders provide nature lovers the ability to witness schools of fish, hummingbirds, parrots, egrets, brown pelicans and other endangered species while the waters edge laps against ancient cactus and majestic boulders. Secret Gardens is the perfect place to host friends and family to celebrate special occasions like milestone birthdays, anniversaries and reunions. When rented along with its sister property, Coral Gardens Beach Estate, up to an additional 40 guests can be comfortably accommodated. For those simply wishing a secluded journey, Secret Gardens will lavish you in your pursuit of love with an endless array of world-class style and an unparalleled standard of service. Your exclusive personal attendant(s) are nearby to accommodate your every wish from grocery provisioning, cooking, butler/valet, maid & bartender services as well as spa & concierge fulfillment upon request. Your home away from home awaits you to explore the unexcelled five star villa resort experience of Secret Gardens! The house was beautiful. The location of the house was just what we were looking for. Close enough to everything but still seemed very private. The home has everything you would need while there. It’s decorated so pretty not your everyday cookie cutter home. We spent lots of time in the pool that has an amazing view also. Which that’s included in almost the whole house. Beautiful sunset views from inside or any one of the wonderful decks. If you get the chance to charter the boat that Werner has to take out, do it. It was absolutely stunning. One of the most enjoyable things we did. Can’t say enough about Werner He so helpful and an amazing host. If you get the chance to go. This is a wonderful place to stay !! Pir 1st time to the island and was just about perfect. And dont get me started on the view, pool, pelicans or crystal clear waters. I miss it all already and we have only been back 48 hours. 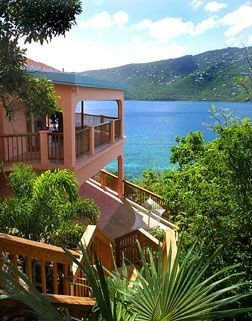 Best villa on St. Thomas with incredible views and spectacular interior design. Everything the four of us hoped for including snorkeling right out front. The owner/host Warner is the very accommodating and can arrange for any needs. We will come back again. Booked as a surprise for my wife's birthday. Werner and his staff are superbly professional. Not simply a rental home but was a hosted vacation experience. All the small details were taken care of from food and necessities to reservations and experiences/excursions. One day was spent on the host's boat Triple Smooth with Captain Ocean island hopping. To say the villa and grounds are breathtaking is grossly underestimating Secret Garden's beauty and tranquility. Private chef dinners and massages were arranged with ease and made our experience memorable. Any request to make your trip more special can be coordinated with you hardly needing to utter a word. Werner's knowledge of the island also made exploring and shopping so much easier. Werner went the extra mile to make us feel at home and this a trip of a lifetime. Do not book anywhere else. You will be vastly disappointed. Secret Garden is Paradise... enough said!! One MUST experience this little piece of heaven! My family and my fiance and I traveled to this place I call Paradise for our wedding. We had not organized a thing and Werner and his staff were more than amazing! We had the wedding every woman (couple) dreams of! Werner treated me as a Queen and my family just the same! I can't thank Werner and his staff enough for a memory that was created for a life time! We arrived and everything was handled. Every detail was taken care of before you could think of it! The villa is breath taking. The view puts you in a trance. Listening to the waves crash day and night couldn't have better music! We visited St John's one day and snorkeled with the sea turtles. We went on a day boat excursion with Werner and our captain Fernando island hoping the British Isles. The water was so beautiful, just like bath or swimming pool water. We enjoyed the Rum and sun and water and excellent food continuously! What an amazing boat and day! I recommend the chef as he cooked us a fabulous breakfast the morning of our wedding! We were married at Megan bay beach at sunset and our photographer was amazing! Our minister told us our marriage certificate was only good for 1 yr so we have to return to renew it annually! We can't wait! Secret Gardens is truly Paradise and I recommend it for the comfort and enjoyment and memories that it brings! Like I said...Werner your amazing! Thank you so so much!! Memories were created for a lifetime! It was the dream wedding every woman (couple) dreams of! Perfection in every aspect! Paradise.... enough said! Rates are subject to change until reservation is confirmed. There are no refunds for cancellations, however, owner will offer similar dates for cancellation or postponement. Feel free to contact owner (Werner Scott) at 214-500-7307 regarding any questions.